Today I am enjoying my cup 'o Joe in Georgia with my Mama. Its a lovely day, but I forgot it was Friday and I owe you a recipe! This Bitter Sweet Chocolate and Pear cake is a Gem, but a bit difficult. This recipe comes from my A#1FAV Smiten Kitchen- who begged for it from Al Di La Restaurant in Park Slope, Brooklyn - and I am so glad she did- its kindddd of magical. The recipe on her site has a bajillion comments, it apparently is more difficult then it seems- so I am going to comment on the places where I really effed it up so you don't! Pay close attention - but don't worry too much, because even though I did REALLY mess some things up, it was still ace (and a BEAUT don't you agree?!). No recipe card on this baby, so better bookmark it! 3 eggs, at room-temperature * Where I messed up No.1 - make sure your eggs are freakin’ room temp. - leave them out in a room for an hour, or place in a luke-warm bowl of water for about 20. 1 / Preheat the oven to 350°F. Butter a 9-inch springform pan and dust with flour, set aside. 2 / Sift the flour, baking powder and salt together, set aside. 3 / Using a mixer fitted with the whisk attachment, whip the eggs on high speed until pale and very thick. * Where I messed up No. 2- Beat these babies until they are THICK. Don’t give up. Don’t give in. It will take around 10 minutes with a home mixer. If the bowl is even the tiniest bit damp when you start, they will not peak. I beat them for what felt like an hour, but they didn’t get that firm, and I used them anyway! Bad. Idea. 4 / Brown the butter. Melt the butter in a medium saucepan (it will foam) and cook it until the butter browns and smells nutty (6-8 minutes). Scrape the solids off the bottom of the pan in the last couple minutes to ensure even browning * Where I messed up No.3- make sure you cook on Low-Medium and take your time. I put this on the quick bolt burner on accident and I thinkkkk I may have cooked it too fast and burnt it a bit- take your time! Remove from the flame but keep in a warm spot. 6 / Just as the egg-sugar mixture is starting to loose volume, turn the mixture down to stir, and add the flour mixture and brown butter. Add one third of the flour mixture, then half of the butter, a third of the flour, the remaining butter, and the rest of flour. Whisk until just barely combined — no more than a minute from when the flour is first added — and then use a spatula to gently fold the batter until the ingredients are combined. * Where I messed up No.4 - DO NOT over-whisk or work the batter too much or it will lose volume. My started to flatten, because I , of course, over mixed it. You may need to move quickly and carefully, this cake is a bit temperamental. 7 / Pour into prepared pan. 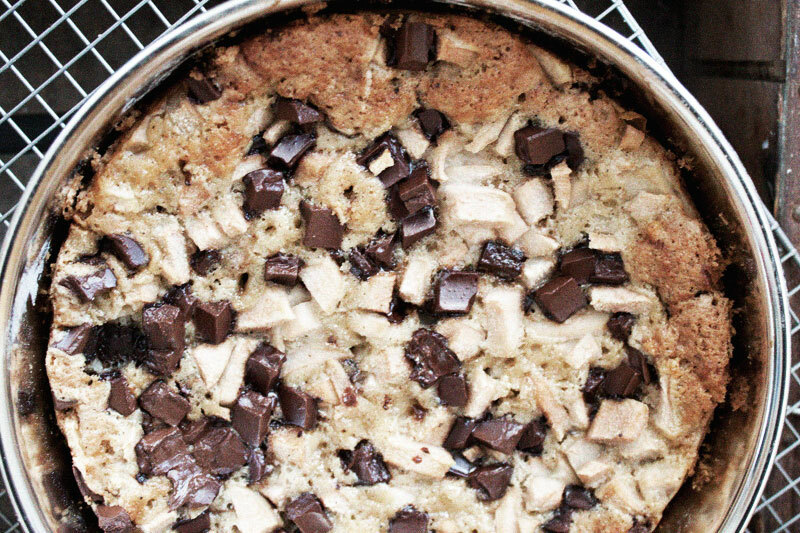 Sprinkle the pear and chocolate chunks OVER THE TOP (do not mix in, its ok, the cake will rise up and engulf the pears and chocolate, promise). * Where I messed up No.5- You need to sprinkle the majority of the pear and chocolate chunks towards the exterior of the cake pan, the center takes a bit longer to cook and the weight of the pears and chocolate will make it take longer, and the cake will engulf everything and it will work out better. Over all, this cake was amazing. You can see in the comments of Deb’s original post that a lot of people were having a lot of trouble. I think its all in the eggs personally, so don’t mess it up, you really need the volume in order for this cake to work. My finished product was a bit mushy in the middle, but it cooked for SOOOO LONG that I knew it was fine to serve, and with a dollop of fresh whipped cream on top, no one knew the difference! * DO NOT take cake out before it is done. I know I say 40-50 minutes, but I only say that because Deb is a pro, and she says so, but mine took about 1 hour 15 minutes and the center was still a bit soft, I totally blame myself for not beating those eggs up to what they should have been. Check the cake at 40-50 minutes but don’t force it, let her cook, it is worth the wait! Served it up warm with some whipped cream or ice cream- or just as is, its amazing either way- I mean the combination of Pear and Chocolate JUST CANOT BE BAD. Thanks Deb for the persistance in getting this recipe, there were a lot of happy people at the dinner table when it was served.